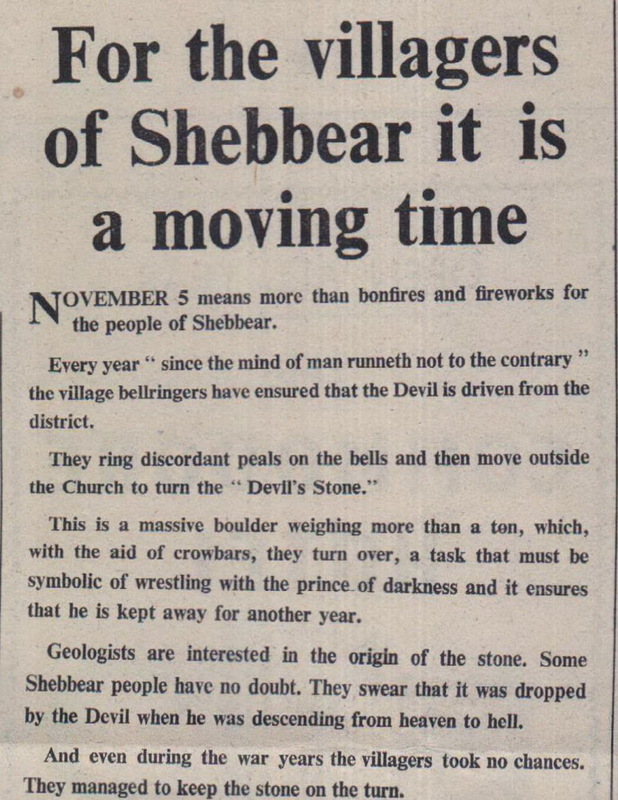 November 5 means more than bonfires and fireworks for the people of Shebbear. Every year " since the mind of man runneth not to the contrary" the village bellringers have ensured the Devil is driven from the district. They ring discordant peals on the bells and then move outside the Church to turn the "Devil's Stone." This is a massive boulder weighing more than a ton, which, with the aid of crowbars, they turn over, a task that must be symbolic of wrestling with the prince of darkness and it ensures that he is kept away for another year. Geologists are interested in the origin of the stone. Some Shebbear people have no doubt. They swear that it was dropped by the Devil when he was descending from heaven to hell.